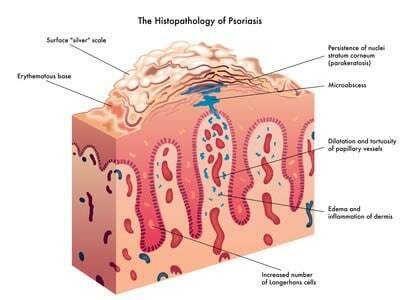 Psoriasis is a chronic (long-lasting) skin disease characterized by inflammation and scaling. When cells in the outer layer of the skin reproduce faster than usual and pile up on the skin’s surface, scaling may occur. Although the disease occurs in all age groups, it primarily affects adults (about equally in men and women). People with psoriasis may suffer discomfort, including pain and itching, restricted motion in their joints, and emotional distress. Recent research indicates that psoriasis is likely a disorder of the immune system. Psoriasis affects approximately 5.5 million people in the United States. In its most typical form, psoriasis results in patches of thick, red skin covered with silvery scales. These patches (which are sometimes referred to as plaques) may itch and burn. In addition, the skin at the joints may crack. Psoriasis most often occurs on the elbows, knees, scalp, lower back, face, palms, and soles of the feet, however, it can affect any skin site. The disease may also affect the fingernails, toenails, and the soft tissues inside the mouth and genitalia. About 15 percent of people with psoriasis have joint inflammation that produces arthritis symptoms. This condition is called psoriatic arthritis. There are a number of treatment options available for psoriasis sufferers including topical, phototherapy, and systemic. In many cases, it may take a combination of these treatments over a period of time in order to control this condition. Abrams Dermatology will work with you to develop a treatment program that addresses the severity and extent of your psoriasis. Call today for an appointment.